1/4” wide x 41" long (6mm x 1m) with 5-15 lbs (2-7 kg) of resistance, this is excellent for high rep exercises. The perfect tool for warm-ups and strengthening smaller muscle groups, particularly around shoulders and arms. 1/2" wide x 41" long (13mm x 1m) and 15-35 lbs (7-16 kg) of resistance. 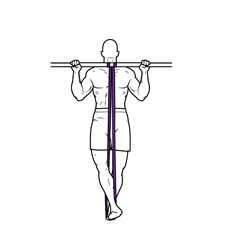 It is a highly adaptable band that can be used to tone almost every muscle group on or off the pull up bar. Best band for low impact high rep strength training. 7/8" wide x 41" long (22mm x 1m) and 30-50 lbs (14-23 kg) of assistance on the bar, the heavy band can be used alone or combined with any other pull up band size to customize the amount of tension needed. 1 1/8" wide x 41" long (30mm x 1m) and 50-80 lbs (23-36 kg) of resistance, this is a perfect place to start on the pullup bar for many of our customers. 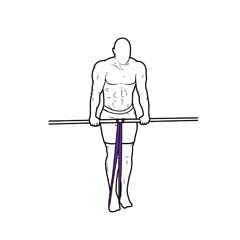 This is our most popular resistance band we sell due to the range of tension it provides. 1.75" wide x 41" long (45mm x 1m) and 70-100 lbs (31-45 kg) of resistance. This heavy duty pull-up band will almost guarantee your first pull up and help you crank out reps as your arms fatigue. 2.5" wide x 41" long (64mm x 1m) and 100-140 lbs (45-63 kg) of resistance. This beefy band is recommended for athletes 240 lbs+ who can do less than 5 unassisted pull-ups. Pull ups can engage and strengthen nearly your entire upper body through the simple motion of pulling yourself up to the pull up bar. It is a highly functional movement pattern that requires multiple muscles groups to work together. If you are like most of us, you probably need a little pull up help to get you going. Lucky for you, Rubberbanditz offers pull up equipment that will help you take your workout up a notch. Below you’ll find a quick cheat sheet that explains how to use pull up assist bands to build strength and scale your rep count. Before you know it, you’ll be a pull up cranking machine! 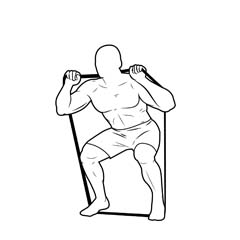 Try out our pull up resistance bands to see for yourself just how effective these bands really are. 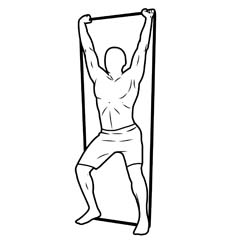 Below you will find a few useful exercises to help with pull ups and other strength training techniques like an assistance chin up. Whether you are starting with modified pull ups or you are already a complete pro, our pull up equipment will help to improve your strength no matter what your current fitness level may be. 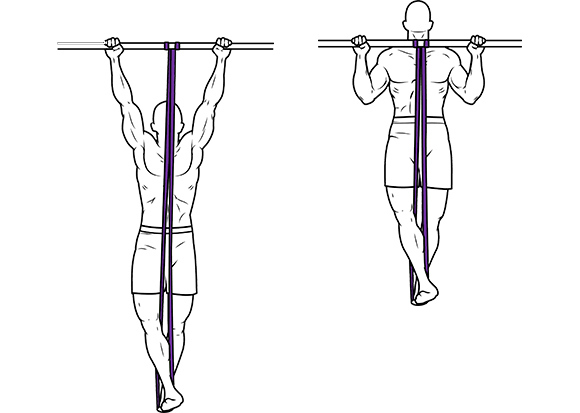 Fasten a band onto the pull up bar by pulling one side through the other. 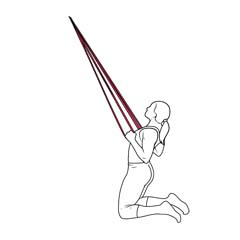 Place a foot or knee in the pull up band. Using the foot makes it easier. Complete controlled assisted pull up reps without swaying back and forth. 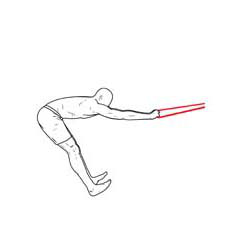 Step out of the pull up strap with one foot, then release the other to avoid snapbacks. 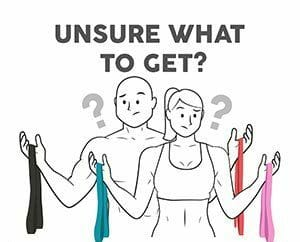 The most common question we get is “Which pullup band is right for me?” We’ve got you covered! All you need to know is your weight and how many unassisted pullups you can do. Once you find your band combo, click on it to see the item in our store. Why Two Bands Instead of One? As you fatigue you’ll need a bigger boost, and as you get stronger, you’ll need to lower the assistance. Mark your progress by lowering the tension. Perform multiple sets in rapid succession while increasing the assistance each time. This maximizes your energy expenditure and accelerates strength gains. "I just received my exercise bands, and was astounded to find out I could actually do pull-ups with them! Of course, I hope to be able to pull up without the bands, but for now I am absolutely thrilled. Super fast shipping too!" 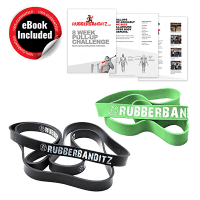 "Brand new to Rubberbanditz I have been able to accomplish my assisted pull ups. I don’t buy resistance bands often, but these are not the cheap resistance bands I’ve purchased a few times in the past. These are the best pull up bands I’ve used." 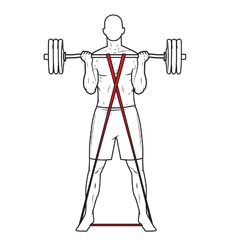 "The Rubberbanditz heavy resistance band help me a lot with my pull-ups at the gym on the pull-up bar. I also use them for strength training exercises in my house." "I bought a pull up strap to help me do more reps. I have seen some results (a little at a time) and still am progressing. I love this pullup accessory! Lol."